If you’re interested in learning how to create SlideShare presentations that generate thousands of views and downloads, this will be one of the best blog posts you’ll ever read. Two years ago, I set out on a mission to uncover insights that would allow me to unlock the power of SlideShare marketing. I started out with very little knowledge of what worked well, and my only presentation was one created back in 2012. I built it from scratch. I drew the slides in a notebook and turned them into pixels using PowerPoint. The information was pretty good, and the deck generated a little over 2,000 views. At the time, I thought 2k views was pretty good. In fact, I was proud of what I had accomplished. But today, things are a little different. 2,000 views would be considered below average for me—very, very, very below average. Along with those views comes thousands of leads, downloads, awareness, and referral traffic. I’m going to show you five lessons I’ve learned to get to this point, and exactly how you can take this information and apply it to your own SlideShare efforts. This might sound like 101 advice, but often marketers are creating content they want to create or that their clients want them to create, rather than what their audience wants. What does that mean? It means, we often create content that we think will be great rather than content that we know will be great. Don’t get me wrong—I know it’s not possible to predict virality, but we can most certainly gather the information required to know what’s more likely to be shared. Once you understand these motivations, it’s time to understand what people are already talking about as it relates to your topic. For me, I like to take inspiration from the content that others have already created. 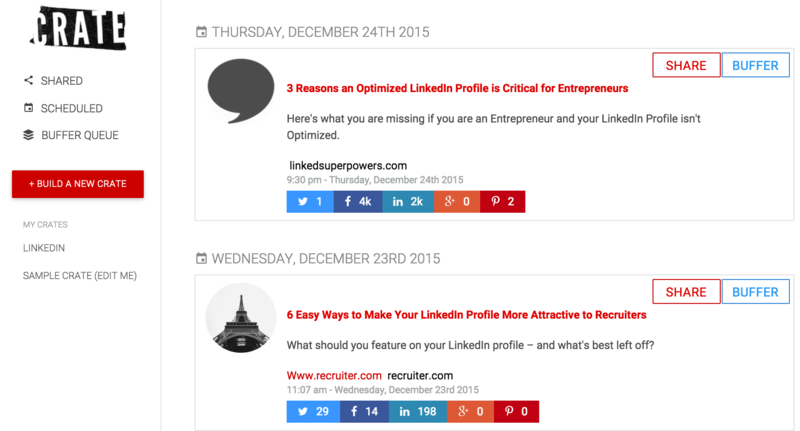 You can do this by using a tool like BuzzSumo or Crate for insights that can help create better SlideShare decks. The results show us that people are interested in learning how to make a great LinkedIn profile. This approach ensures that the SlideShare we develop aligns with the five main motivations for why people share content online. Now that we know what we have a topic and click-friendly headline, it’s time to turn this idea into a reality. Recent studies from Carnegie Mellon University show that people have a serious issue with having information gaps. That is, if there’s something they don’t know (but feel they should), they will do their best to fill the gap. The best SlideShare presentations strive to fill the information gap. Sometimes they capitalize on it in the headline, but it’s most important that they fill the gap in the rest of the slides. 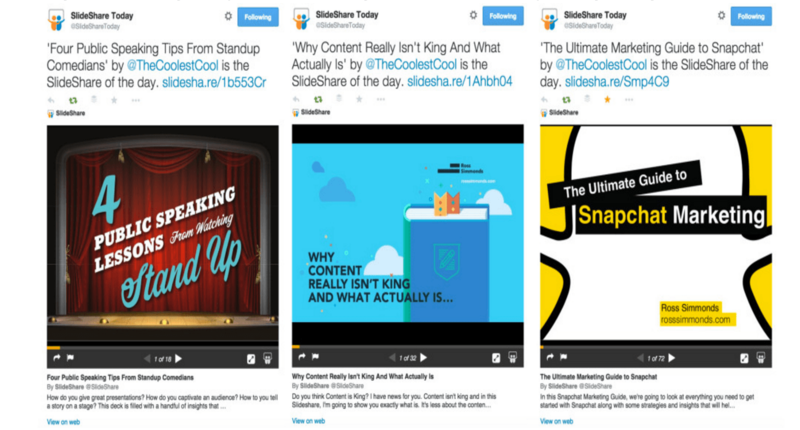 Each year, SlideShare selects the “Must Read” decks by compiling a list of the most impressive presentations. One of the things that each of these decks has in common is that they follow through on the promise of filling the information gap. Other decks featured in SlideShare’s must-read presentations for 2015 include my deck highlighting Five Ways Brands Can Use Meerkat or Periscope For Marketing and the 2015 Internet Trends Report from Kleiner Perkins Caufield & Byers. The best decks deliver on a promise to give people information they desire. First impressions matter, and the first impression on SlideShare is what’s found on your very first slide. When designing your first slide, always ensure that the text is very visible. Think about your first slide like an old CD cover or VHS sleeve. It needs to capture the audience’s attention and have a clear title to show them why they should keep reading. Less is more. Keep your visuals simple and your text to the point. My decks have been featured on the front page of SlideShare more than 10 times over the last couple years and were the inspiration behind “Slideshare of the Day.” The decks that get featured on the homepage are those that have a compelling front slide. Just like your audience, SlideShare doesn’t want ugly slides on their homepage, so those who get it right are more likely to be featured. I’m going to show you how some decks can lure you in within seconds. Once you start using this tactic, you will see your levels of engagement skyrocket. The best part? It’s easy to do. Most people know them as transition sentences, but in the world of copywriting, it’s called a Bucket Brigade. You may have encountered them while watching TV or reading a popular blog. It’s the idea of building up anticipation with your writing to keep the reader following along. I did this with the first five sentences in this lesson. In the first line, I proclaimed, “I’m going to show you how some decks can lure you in within seconds.” This resulted in intrigue. From there, I validated it by highlighting that it’s a tactic that helped my results skyrocket. The next step was continuing to build the anticipation. The first few slides are asking questions that drive you to keep clicking. I build rapport with the reader by expressing that I’ve been there before, but not to worry because I’ll show them the way. I do this over the course of nine slides to establish a level of commitment with the deck that drives the reader to want more. This is the power of a Bucket Brigade. A lot of people rush their decks by using the standard features of PowerPoint. Don’t get me wrong—if you’re a PowerPoint ninja, go to town. Embrace it. Use your skills to create something mind-blowing. The challenge is this: Most people think they’re good at PowerPoint but are, in fact, terrible. You can get away with using ugly visuals on SlideShare, but I’ve seen great decks fall flat solely because of their poor design. I’ve made this mistake myself and have actually taken down old decks to replace them with redesigned ones. It seems like magic, but it’s really just the work of a great designer. 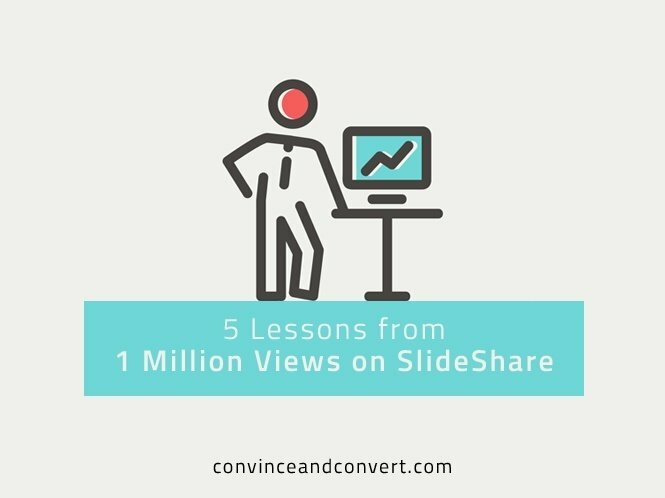 You now know the tips and tricks that I’ve used to generate more than one million views on SlideShare. Now it’s your turn to take these tactics and put them into action.